Taylored Expressions Die Focus: Spooky Trees Accessories! I started by cutting out my tag using the Build a Tag 5 Dies. I cut the base out twice, once with Oreo cs and once with Build a Scene Halloween dp. 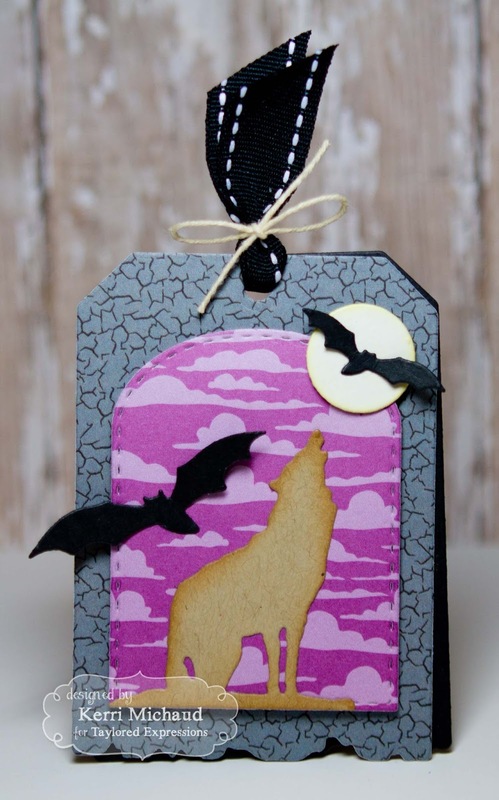 Next I cut out the sky layer using another one of the Build a Tag 5 Dies and some more Build a Scene Halloween dp. I added the wolf cut out of Toffee cs using the Spooky Trees Accessories Dies and sponged around it with tea dye distress ink. I then used a circle dye to cut out the moon and added the bats from Spooky Trees Accessories to complete my scene! Super quick and easy, and I love how it came out! These would be super easy to mass produce! Thanks for stopping by today:) I've been busy working on projects for Taylored Expressions Release Week next week! You are going to LOVE what we have in store:) Have a wonderful Wednesday!